Owner of five-story West Broadway building proposed adding set-back two-story rooftop addition. 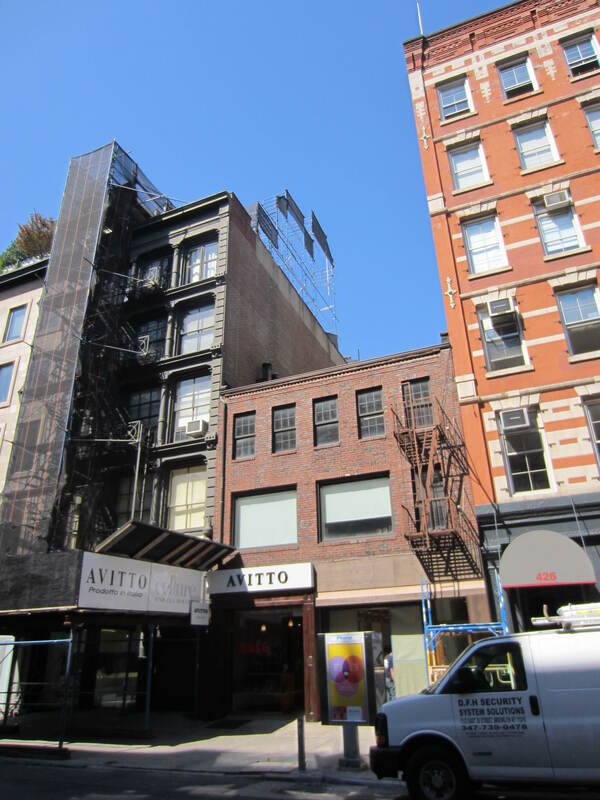 On September 4, 2012, Landmarks considered a proposal by Green 333 Corp. to build a two-story rooftop addition on a five-story building at 422 West Broadway in the SoHo-Cast Iron Historic District Extension. The building’s 1870s Italianate-style facade was restored in 2005. At Landmarks’ public hearing, Stephanie Francis from John Furth Peachy Architect, presented the proposal. According to Francis, the design of the set-back addition had been based on other additions within the district. 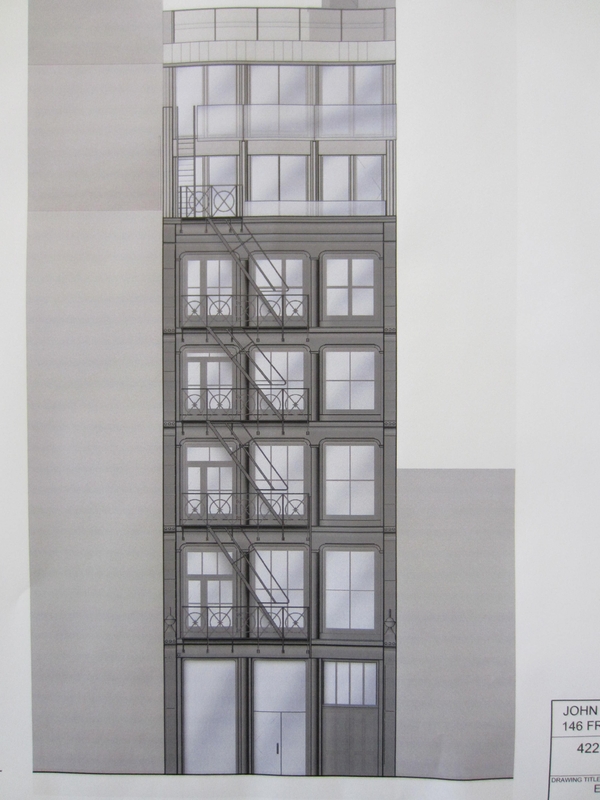 The proposed sixth floor would be set back eleven-feet-six-inches, and the seventh floor would be set back 19 feet. Bulkheads for an elevator and stairs on top of the seventh floor would be set back further. Francis explained that the roof of the seventh floor would be sloped in order to reduce its visual impact. The entire addition would be built 20 feet from the rear facade. While the addition would be minimally visible from directly across the street, the entire north side of the addition would be visible from over the neighboring three-story building. The visible north side wall would be clad in brick. The Commissioners generally found that the proposal was too large and visible for the five-story building. Vice Chair Pablo Vengoechea pointed out that the proposal was nearly one third the size of the existing building. Commissioner Michael Goldblum criticized the stucco-like material chosen for the addition, and also suggested eliminating the seventh floor. Commissioner Fred Bland stated that it was unfortunate for the owner that it had “a short neighbor,” and agreed that the highly visible proposal overwhelmed the existing building. Commissioner Libby Ryan stated that she was more concerned about the addition’s overall bulk than about how visible certain portions of it would be. Chair Robert B. Tierney agreed with the other commissioners, and asked Green 333 Corp. to return with a redesigned proposal. LPC: 422 West Broadway, Manhattan (13-0754) (September 4, 2012) (Architect: John Furth Peachy Architect).